I am an easily agitated person. “That makes me so mad” is a common utterance from my lips. Whether it’s a political issue, interpersonal relationship breakdown or just a general life annoyance, I’m far too quickly brought into a frenzy of fury. I’m sure it isn’t good for my blood pressure, and according to this scripture, it’s not how the Lord would have me respond to life either. I dislike the word angry. Like my favorite Seahawk, Doug Baldwin, I prefer the term “passionate”. For me, anger implies an intent to take it out on someone else. Passion creates strong feelings for sure. It requires a wrong to be righted, dictates a dissatisfaction with an unresolved issue, demands excellence and stirs up uncomfortable conversations. Despite seeing passionate responses in my own life, I bristle at being called angry. I view my responses to life as two sides of the same coin. Unabashed joy and excitement over things I love, and vehement displeasure when something isn’t “right”. I don’t see how you can have one without the other. The deep passion that simmers within my soul, expresses itself equally regardless of the circumstance. In the same way I get goofy silly and take extreme delight in pretty banal things, my blood boils quickly at even the slightest injustices. 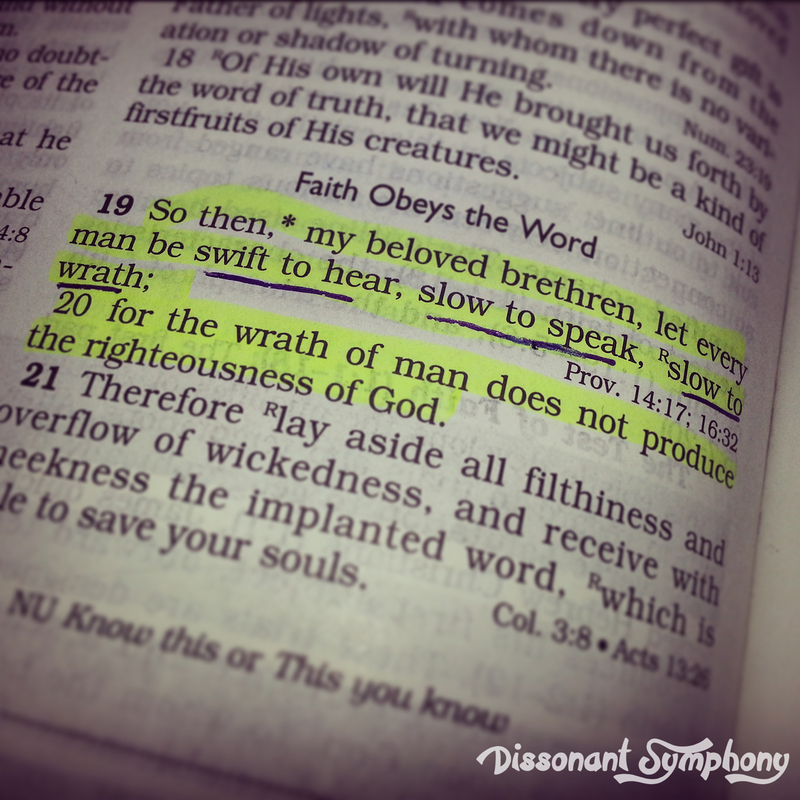 However, these verses call me to be slow to speak, quick to listen and slow to wrath. Beyond that, if I want my heart to be renewed and reshaped into more of the righteousness of God, anger is not the way to get there. Now, notice the verse doesn’t say “don’t be angry ever”. Or “wrath is evil”. Not “shame on you for getting upset”. 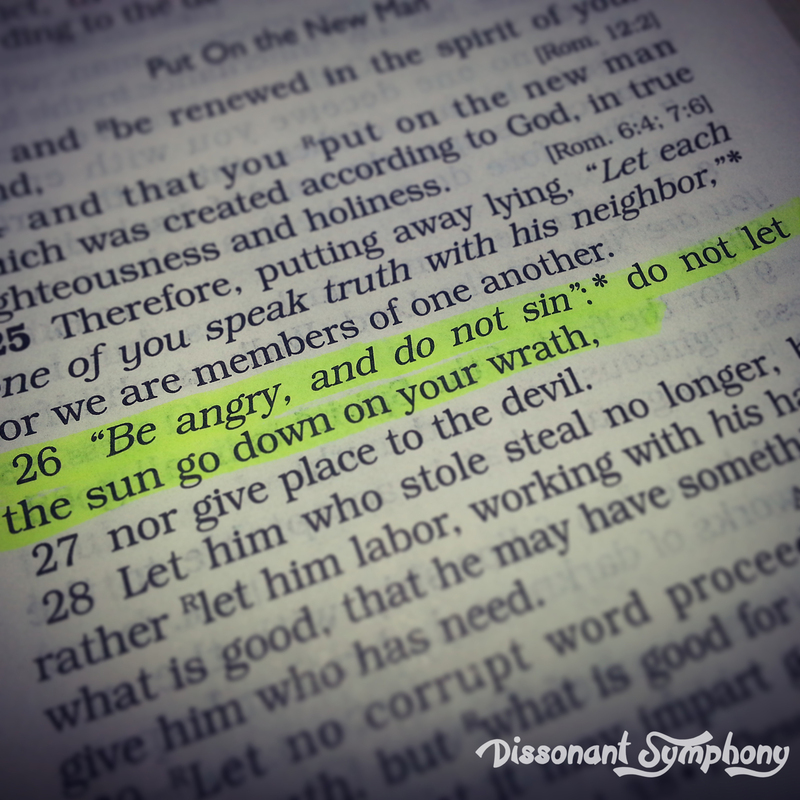 In fact, Ephesians 4:26 reads “Be angry and do not sin: do not let the sun go down on your anger.”. That’s practically permission to be angry. Or, at least an acknowledgement that you will be. Call it what you want. Irritation. Exasperation. Indignation. Outrage. All natural human emotions. Nothing to feel guilt or shame over. It’s going to happen. What you do with those feelings is what counts. Put together, these verses paint a pretty clear picture. You will get mad. Stuff is going to piss you off. That’s ok. Just take the long and winding road to the destination of outright wrath. Anger should be a last resort, not an immediate reaction. Don’t decide to camp out once you arrive at aggravation. Deal with it. Move on. I find the Bible generally gives some helpful hints to accomplish any instructions. I’m guessing slow to speak and swift to listen go a long way towards “sinning not” in the midst of anger. I’ll try to remember those tips the next time I’m feeling a passionate response brewing.